Hey hey! Phew, two cards in one week. I'm getting better at this bloging thing again. ;) I participated in a card swap and the card I'm about to show you was made for my swap partner. I was inspired by the sketch that is a new challenge at The Sketchy Challenges. I hope you will come play with us! Hey, hey! Today was a BIG day. It was my little girl's first day of daycare. I have to admit I was *terrified* of this day. I mean REALLY terrified! I didn't know how Amadeja will react to all the other children, the teachers etc. Everything was new to her! Well, at first there was some crying, and for the first 10 minutes or so she was scared to go more than 1 meter away from me, but soon she started exploring the new toys and started playing with her new classmates. Today we only stayed there for about 90 minutes and probably will be more or less the same on Monday, but on Tuesday I will probably leave her alone for a short period of time and then the same on Wednesday... I know it'll be hard for both of us, but from what I saw today I am confident that she'll enjoy her time in dayscare. Now that I got that off my chest let me show you the most recent card I made. 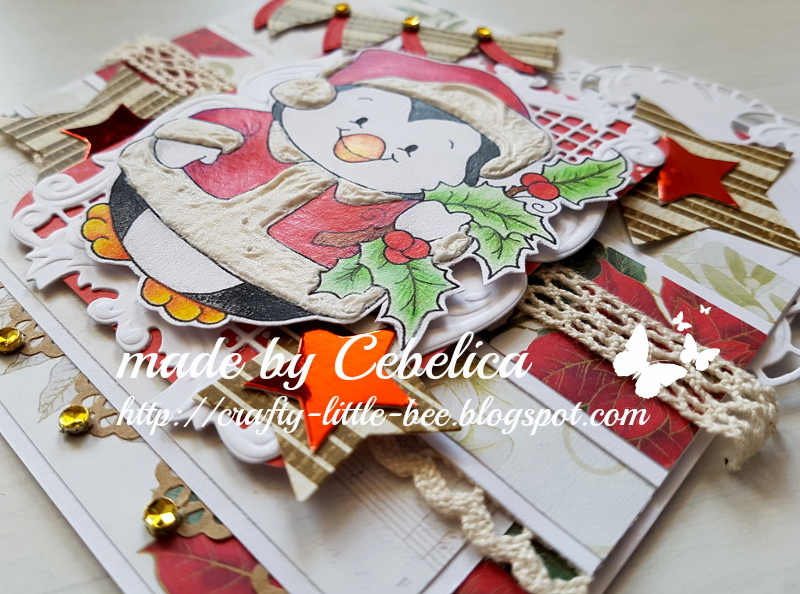 It's another Christmas card - I still have plenty of those to make! Once again I used one of the adorable Whimsy stamps digi images. 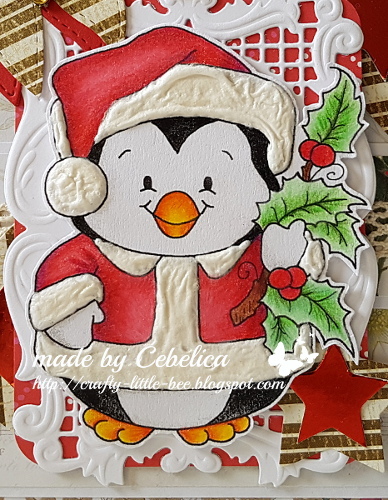 I did the colouring with pencils and Promarkers and I added some liquid applique on the white parts of the penguin's dress. 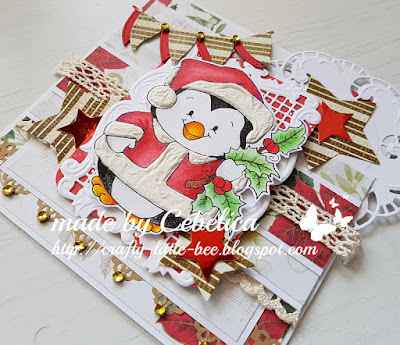 Papers that I used are from DoCrafts and Scrapworks. I only used some lace and gold crystals to embellish the card. Die cuts used are from Joy crafts (rectangle frame), La La Land (banner), Nellie's (stars), Marianne design (doily) and Cottage Cutz (border lace). 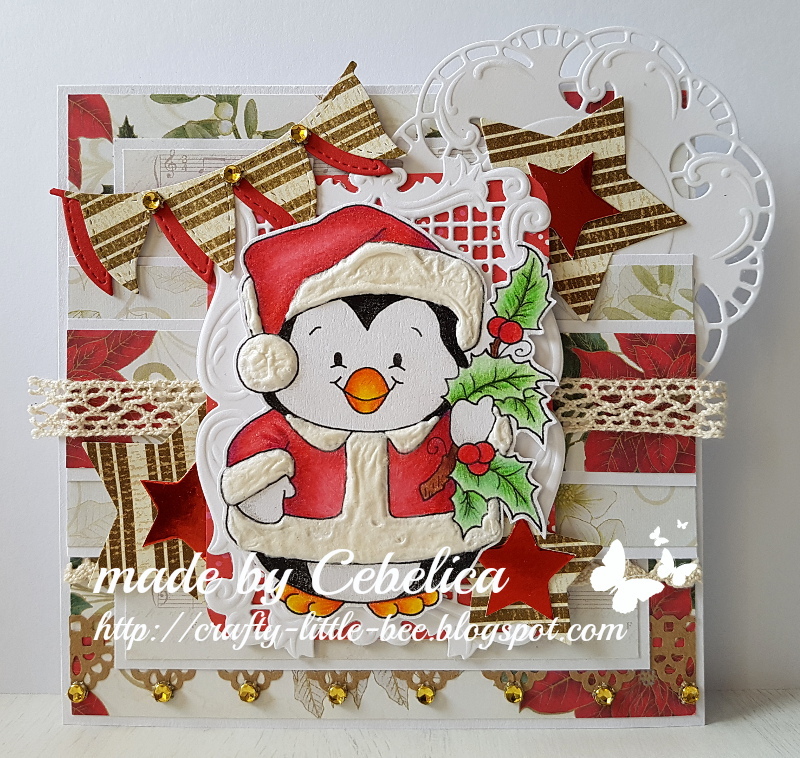 Image and frame were raised on foam pads to give the card some dimension.